Headdresses and coverings are among the most powerful vehicles of cultural identity, whether of nationality, gender, ethnicity, religion, profession or subculture. With Hybrid Heads, designer Daniela Dossi questions the symbolic, political and social values of contemporary headdresses by compiling an extensive archive of press photos from around the world. Starting from this, she developed a decoding method and open design system to create dynamic cultural identities. Cultural identity is continuously evolving. Images, texts and textiles become a vehicle to investigate prevailing dynamics of identity, visual stereotypes and cultural representation. Cultural identity can be used to distinguish or divide people, but can also be understood as a constructive instrument, that allows us to recognise mutual differences as a common value. 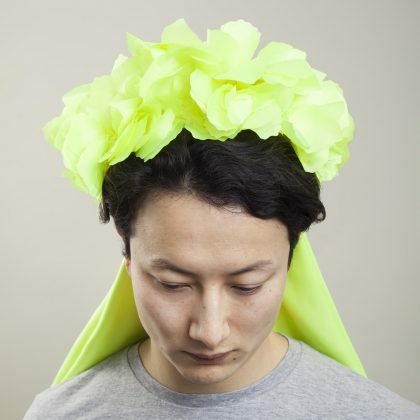 The textile research, the archival images and the first collection of hybrid headdresses are the outcomes of Dossi’s long-term residency in the open and collective textile art studio of Manoeuvre, a multidisciplinary artist-run space in the Rabot neighbourhood in Ghent. The super-diversity of the studio provided the ideal context for this research. Together with Daniela Dossi, participants from diverse backgrounds and origins produced 800 textile samples by hand with different techniques. New hybrid headdresses and narratives can thus be designed by remixing images, texts and textiles. What would the headdress of the first Mexican female President of the United States look like, for example? Hybrid Heads is a project of Daniela Dossi and Manoeuvre, a multidisciplinary artist-run space and residency platform. In the framework of Hybrid Heads, research has been done into the visual methods applied in the textile collection and archive of Design Museum Gent.